Bag Yourself the same dress as Blake Lively at Belle Dress Hire! Do you think Blake Lively’s fashion sense is amazing? Would you love to mimic her style at your next big event? 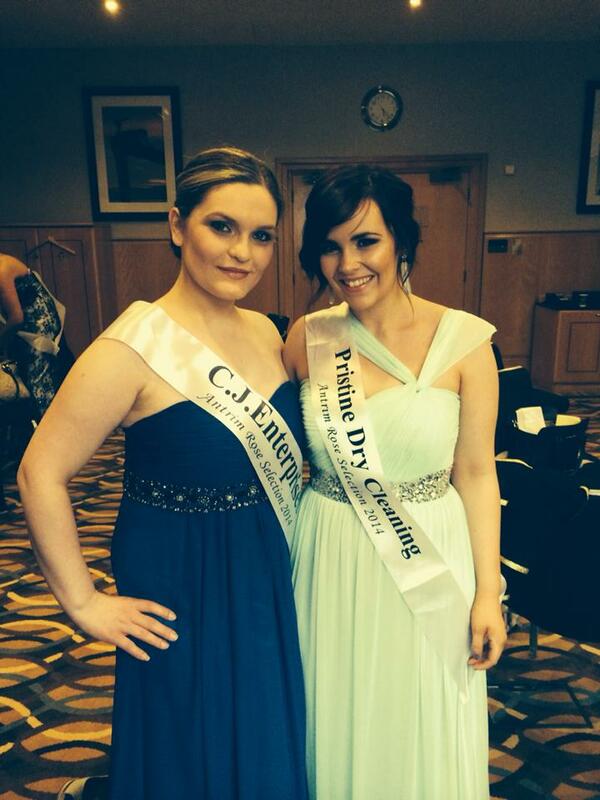 Look no further than Belle Dress Hire in Lisburn …. This dress is available to hire in a stunning raspberry shade which is so striking especially in the Summer. Now one of the main reasons Blake makes this dress look even more special is the addition of coloured ear rings in a rich turquoise. Because it’s coming into the warmth of Summer you can afford to think outside of the box in terms of accessories at Black Tie events. Take a leaf out of Blake’s book and snub the traditional diamante bling ear-rings, bracelets etc at your next event. It could just make the difference and turn a simple, elegant gown into a fashion forward, eye catching statement. La Perla has removed an extremely skinny looking mannequin from their Soho store in NYC and have said they will not use this particular “dummy” moving forward. I wanted to comment on this headline because I see women and young girls at their most vulnerable during appointments at Belle Dress Hire. I am still surprised to hear ladies who look absolutely fabulous in my eyes, complain about that little bit of skin fat that hangs between the armpit and shoulder or the non existent bingo wings, back fat, “food baby” etc etc There has never been a customer that has come to me without complaining about at least one part of their body. Problem is whenever women come to me to try on dresses, they come out of the changing area and face a mirror which is over 8 feet high and at least 4 foot wide. There is no escaping the image staring straight back at my customers. It’s their full body on display. No photoshop, soft lighting or camera angle trickery unfortunately can be used. For the majority, they can only see in the mirror all the parts of their body that they hate. Rather than looking at themselves as a package of sorts which has positives and negatives, more and more of my customers express to me their feelings of hatred towards their bodies. I have been increasingly aware of this amongst my younger customers who are attending school formals. I discussed this recently with a Secondary school teacher who admitted to me that she is actually horrified by the feelings towards body image of her 16-17 year old pupils. Apparently, “skinniness” and weight issues are discussed with furore and would be one of the most prevalent topics of conversation throughout the day. It’s not only the under 20s who don’t give themselves any credit when it comes to their shape but I’ve noticed it more and more amongst my 30-40 year old clients as well. What makes this even more sad is the fact that a lot of these ladies have embarked on dieting/fitness journeys which have seen them lose stones in weight. Rather than focus on their remarkable achievements they continue to criticise the image in the mirror, highlighting all the flaws they consider to still be there. I am the worst culprit of this so I’m not sitting on my high horse telling everyone to be more like me, quite the opposite in fact. I just think that next time I look in the mirror, rather than tut at my thighs (which is always the first place that I look) I’m going to try and smile with thoughts of how that new conditioner I bought makes my hair look really shiny. I’m not expecting miracles to happen as I know another negative body thought will creep in instantaneously but when it does I’m going to think about another positive …. I’ve always liked my skinny feet for example. Listen, I’m ready to give it a go. Main aim is quite simple NOT TO BE SO HARD ON MYSELF. 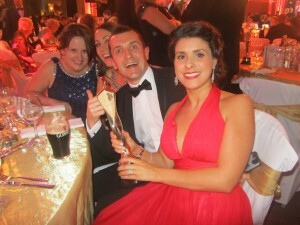 Another Touch of Sparkle at the Europa …. 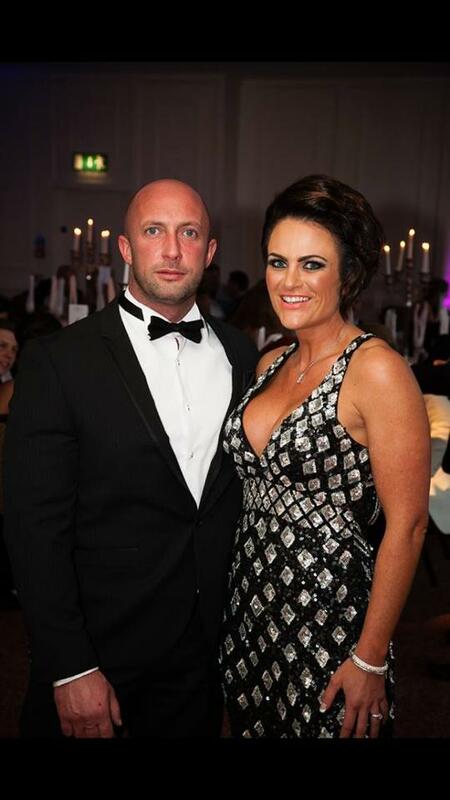 ….. in this stunning, full length, sequin, halter neck, razor back gown in black and silver, Belle customer Julie shines again at Gerrys House of Fitness event which was held at the weekend. This dress is one to be worn with confidence. As it is fully beaded with sequin from top to toe it is actually quite heavy to wear. The plunging neckline and low back is not for the faint hearted and Julie wore the dress brilliantly. SHE wore the dress not the other way round which can happen very easily in a glamorous style like this. Even though the plunge is quite deep at the front and the back zip is literally centimetres above the bottom, the shape of the dress is extremely simple and very flattering. Julie has kept accessories to a minimum and worn a dramatic smoky eye which works perfectly. This is definitely a FORMAL/EVENING WEAR dress only really suitable for a black tie event and is available to hire in sizes 6/8 and also 10/12. 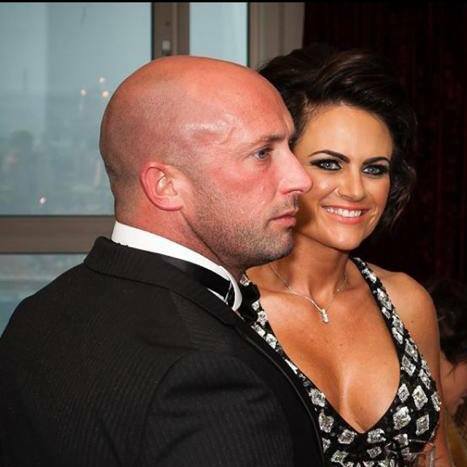 Attending the annual Gerrys House of Fitness event at the Penthouse of the Europa Hotel in Belfast, Gillian looks absolutely beautiful in this gorgeous buttermilk, full length, beaded style but as you can see it’s definitely not your typical formal dress .. This dress has a three quarter length overlay of fine mesh fabric with beading which extends into a fully sheer bottom from just below the knee. The lightness and rich colour of this dress makes it perfect for Spring/Summer events. The one shoulder means you can wear a strapless bra if extra support is needed for the bust. The beading is mostly metallic silver, a little bit of gold and also diamante which actually gives you loads of options for shoes and accessories. 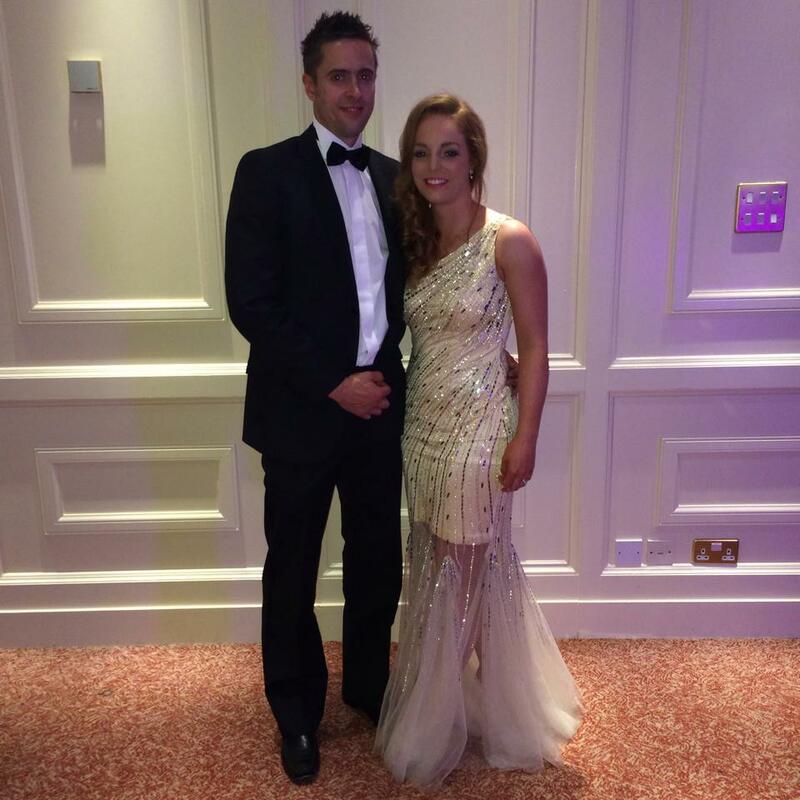 Gillian has chosen to wear a medium tan on her skin which I think compliments the dress perfectly. With this colour of dress I would highly recommend a spray tan. This style is a particularly small dress and is available for hire in a size 6. 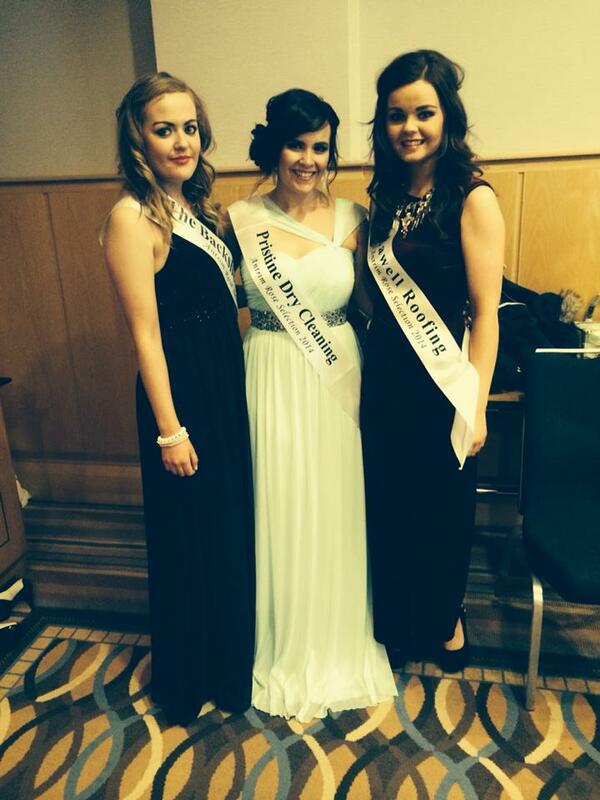 Antrim Rose of Tralee finalist, Jacinta (centre) looks absolutely beautiful in this stunning, mint green dress. This unusual sweetheart neckline and floaty fabric down to the floor, gives the style an ethereal glow and has such a wonderful lightness. However, do not be deceived, this dress gives you a fabulous shape! Just look at how small Jacinta’s waist is and considering this dress is very light in colour, that’s normally quite difficult to achieve. The top of the dress is cleverly ruched and actually very well boned as well so it shapes the bust and rib area. The addition of a diamante/sequin band just above the waist, nips Jacinta in at the smallest point. I have to be honest, mint green is NOT for everyone. After seeing a few customers try this dress on, I would only really recommend brunettes or redheads to wear this hue. Even loading up on layers of fake tan will not help if you’re a blonde. It just looks too wishy washy. Jacinta has teamed the dress beautifully with tousled curls which again compliments this floaty style perfectly. This dress would be perfect for a Spring/Summer wedding or to a May Ball. Available to hire at Belle Dress Hire.